Comet Lander Deploys Drill, But Could Lose Power Tonight : The Two-Way Fearing that Philae's batteries won't last past Friday, engineers are looking at possible ways to help it get more power from its solar panels. One ray of hope: Its comet is heading toward the sun. 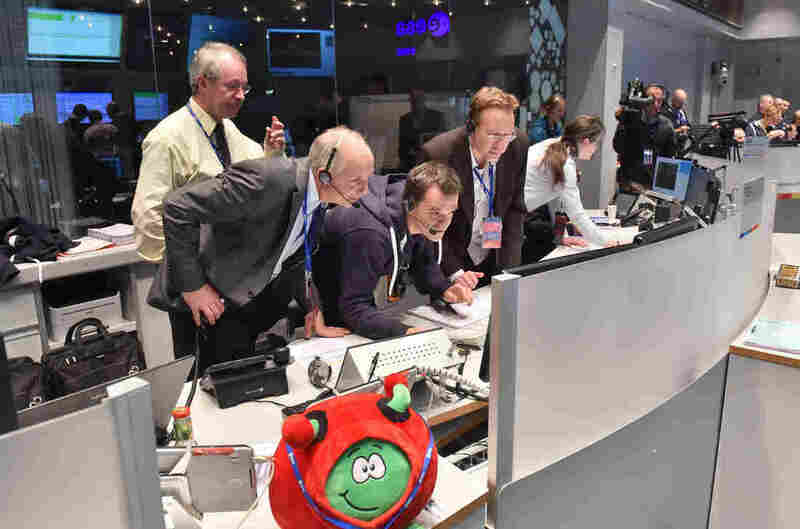 Engineers at the European Space Agency fear that they won't be able to communicate with the Philae lander after Friday. Here, lander manager Stefan Ulamec (left, in foreground) watches as data confirming the comet landing arrived Wednesday. Philae, the lander currently on comet 67P/Churyumov–Gerasimenko, may not be able to perform its extended mission — scientists at the European Space Agency worry that the probe may have landed in a spot too shadowy for solar panels to recharge its batteries. The ESA says it may not be able to contact the craft after Friday night. Worries over the robotic lander's power supply prompted engineers to take the risky step of activating its drill, an operation that had been shelved out of fears that it would sap the remaining charge. "The drill has been active already today. Whether it will actually take samples and will succeed in bringing these samples to ovens... we shall know this evening," lander manager Stefan Ulamec said in an update Friday. Ulamec said Philae also has been instructed to penetrate the comet's surface with its hammer and to use its X-ray spectrometer. Even so, he warned there was a chance the lander might not be able to beam its findings back to researchers. There is a chance the lander could get more power, either this week or in the coming months. Comet 67P is currently between Mars and Jupiter, and it's heading toward the sun. Engineers are considering ways to reorient the lander's solar panels — or perhaps to use its on-board flywheel to jar it from its spot in the shadow of a cliff — so it could absorb vital energy, run at full power, and take advanced readings from the comet's surface. 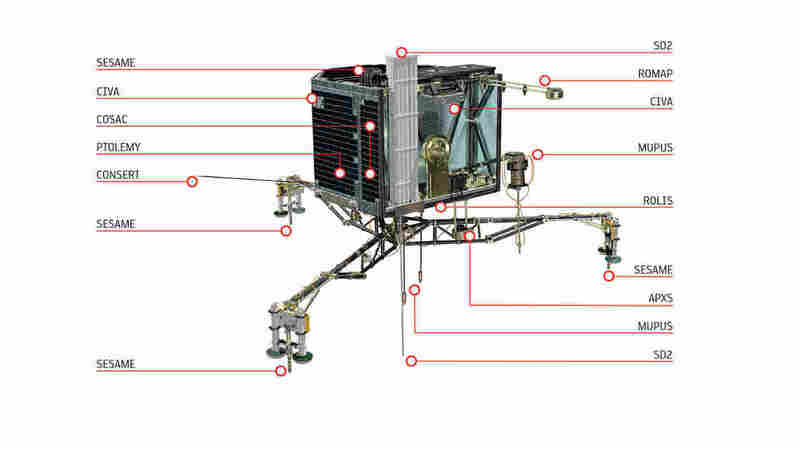 Complicating any such attempt is the fact that while the ESA has received "selfies" from Philae on the comet's surface, engineers aren't sure of the lander's exact location on the comet. Analysts are poring over photos from its parent orbiter, Rosetta, trying to find it. Those problems have somewhat tempered the celebration of a new step in space exploration, after the lander ended its 10-year journey by landing on a comet more than 300 million miles from Earth Wednesday. For now, Philae is running on its two batteries, Ulamec said, "plus, the very limited power we get from the solar generator." That's enough of a charge for the lander to send data through its next contact point Friday night, but engineers are worried that Philae won't have enough power left to communicate reliably Saturday. The precarious situation stems from a failure of the lander's harpoons to fire when it first touched down Wednesday. Weighing only about as much as a sheet of paper on the comet due to its low gravity, the lander (which weighs around 200 pounds here on Earth) bounced twice before settling far from its intended landing site. "It looks a bit bad, but we can always hope," said Valentina Lommats of the German Space Agency, noting that the lander is in a corner, surrounded by rocks. "Cross your fingers — or press your thumbs, if you're German," she later added. There is a lingering hope, Ulamec says, that the lander might resume working later, when the comet it's riding on gets closer to the sun. Comet 67P will reach perihelion, its position closest to the sun, in August of 2015. If the lander does manage to get more power, the development would be a huge boost for the ESA mission, which had planned to study the comet's structure, and how it might change as it nears the center of the solar system. Philae was launched into space back in March of 2004, along with Rosetta. Asked Friday what he wishes the craft had now, Ulamec said, "a larger battery." The Philae lander carries 10 main instruments, from an X-ray spectrometer to sampling and drilling probes.